Bolas Heath is found in the heart of the North Shropshire countryside in a charming peaceful location. In spite of its rural location the property enjoys easy access to local amenities. The thriving village of Tibberton is only two miles distant and offers a wide range of facilities including a church, pub, primary school, village shop, mobile library and village hall. The village has a strong community presence and has various clubs and societies including WI, Brownies and a youth club. Equidistant is the village of Waters Upton which has a number of amenities including primary school, village shop and restaurant. A greater variety of services can be found in the local market towns of Newport and Market Draytonas well as further afield in the larger conurbations of Telford and the medieval town of Shrewsbury. The area is extremely well served educationally with both private and state primary and secondary schools and well reputed grammar schools in Newport. The renowned Harper Adams University is located in nearby Edgmond. The quiet, rural location belies the fact that this property is situated only three miles from the A41 and consequently is well placed for access to motorway and rail links. Since being built in 1976 subject to an Agricultural Occupancy Restriction, the property has been occupied by the same family . The single-storey property comprises a substantial-sized sitting room with fire and dual aspect windows, dining room with double doors to the rear garden and kitchen. Beyond the kitchen is a utility room leading to the attached double garage. In addition there are three bedrooms and a family bathroom. Beechfield would undoubtedly benefit from a scheme of modernisation throughout as it has remained largely unaltered in décor, fixtures and fittings since its construction. A substantial tarmac parking area is found to the front and side of the property and charming gardens surround the further three sides. The gardens are predominantly laid to lawn which is interspersed with a selection of mature trees and shrubs. 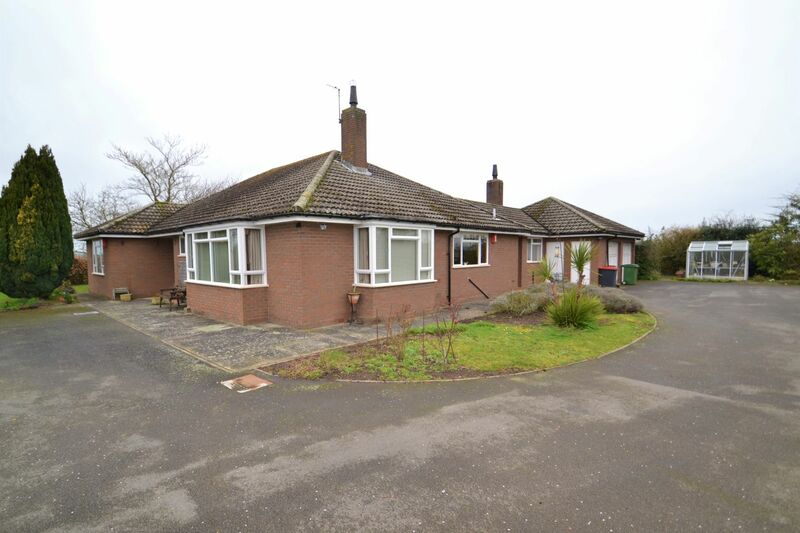 To the rear of the bungalow is a garden with patio area leading to the dining room and rear hall and this sheltered seating area is well placed to take advantage of the peaceful outlook over open farmland to the rear of the property. Please note that the property is sold subject to an Agricultural Occupancy Restriction. This limits occupation of the property to those employed in, or last employed in, agriculture or forestry locally to the area. For further clarification on this restriction please contact the Agents. Please note that if the buyer is successful in gaining planning permission to remove the Agricultural Occupancy Restriction then the current sellers or their heirs will be entitled to a 75% proportion of the increase in value.